Today’s WAN technology is struggling to keep up with modern day businesses. Software Defined WAN (SD-WAN) offers seamless bandwidth optimization within today’s distributed enterprises. SD-WAN is application aware and dynamically routes critical applications over a combination of private and public access types to reach multiple locations. SD-WAN offers businesses far greater visibility into their WANs – including a more accurate picture of which applications are running and how much bandwidth they consume – and a simple way of prioritizing those application. First Communications’ SD-WAN is cost-effective, resilient, secure, and highly scalable. SD-WAN are the ideal solution for growth oriented organizations. 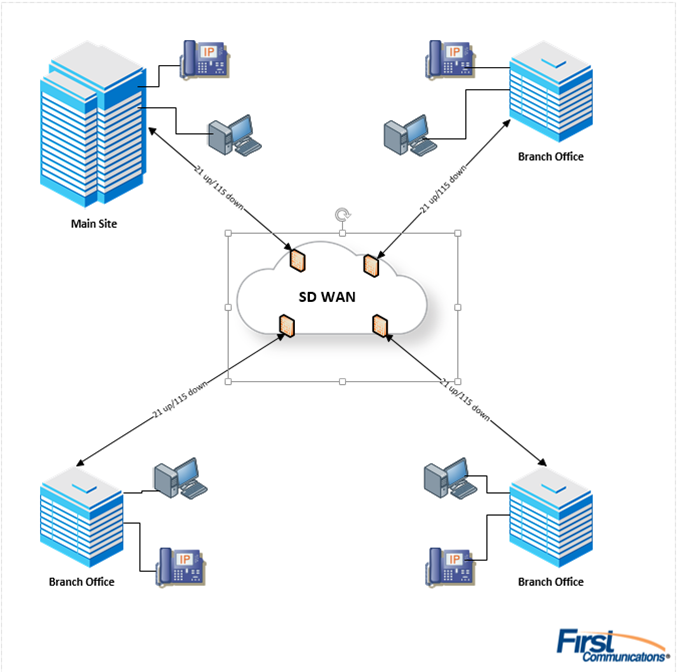 First Communications’ SD-WAN solution delivers cloud-based, secure, dynamic and cost effective networking to remote site & branch office locations via software controlled intelligence – regardless of the access point or underlying connection type.